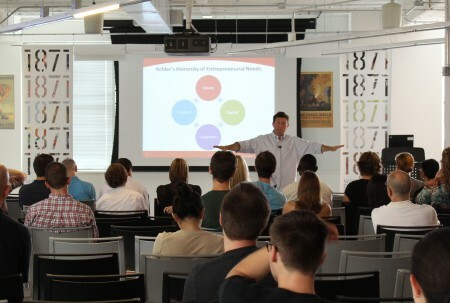 This morning 1871 was lucky enough to have Mark Achler, Senior Vice President of New Business, Strategy, and Innovation of Redbox, come speak on the importance of integrating values into company culture. Starting off his early morning presentation with a round of heartwarming jokes, it was clear how important connecting with people is to him. A string of notable accolades under his belt, notably the serial entrepreneur of four companies, a partner at a venture capitalist firm, and currently an intrapraneur at Redbox, Achler could only stress the importance of values in helping him through every step of his career. Integrity. Do the right thing: At one of his companies, Achler had to let go of the CEO. The board made the change without any prior notification to the CEO in question. Achler regrets not having the personal courage to reach out to the CEO himself because it hurt both business and relationships within the company. If a certain decision does not feel right, like something that could come back to haunt you, rethink it. Always do what feels right to you. Empathy. The secret weapon: Lastly, “if you can truly understand someone, customer, partner, someone from another department, you can design products and services to meet those needs.” Redbox had a deep understanding of what customers wanted from a movie rental service and gave them just that - simplicity, value, and convenience.